My nephew loves nothing more than digging holes. My sister-in-law no longer fights it and instead has resigned herself to a backyard full of trenches, mounds of dirt and holes of various depths. There’s something inherently satisfying in digging (with or without purpose) and at some stage, most kids begin digging a hole with the intention of reaching the centre of the Earth. 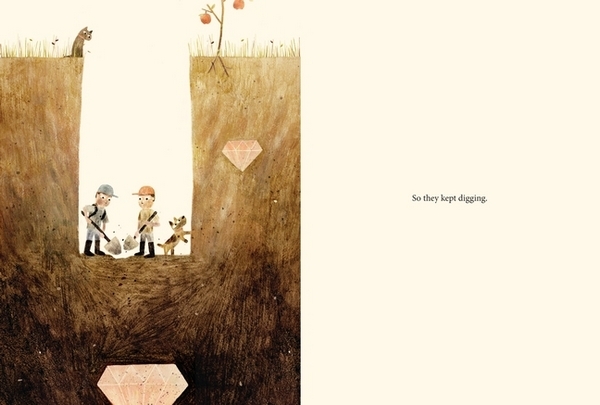 Sam and Dave Dig a Hole is the latest offering from talented team, Mac Barnett and Jon Klassen. Sam and Dave are on a mission. A mission to find something spectacular. So they dig a hole. And they keep digging. And they find . . . nothing. So they change direction. And then they split up. And then they stop for hot chocolate and animal biscuits. Where will their digging end? After pages of deadpan humour, I won’t give away the rather fanciful ending, short of saying it’s brilliant. 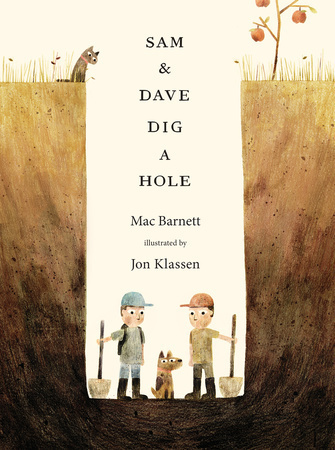 Sam and Dave Dig a Hole is Barnett and Klassen’s second collaboration. The first was Extra Yarn, a story that I think is one of the best picture books published in the past five years. Where Extra Yarn was studded with deeper messages, Sam & Dave is simply very funny. Laugh out loud funny. It might seem impossible to capture that classic pantomime action sequence “He’s behind you!” in a drawing, but Klassen has done it with Sam, Dave and their little dog, who is busting to show the boys where the treasure is lying while they tunnel in different directions, the jewels lying just one spadeful away. Although the cross-section illustrations seemingly show the reader where the story is headed, small details are included that imply the ending is not so clear-cut – look out for an apple tree that becomes a pear tree, and a weathervane that changes from chook to duck, to name a couple. 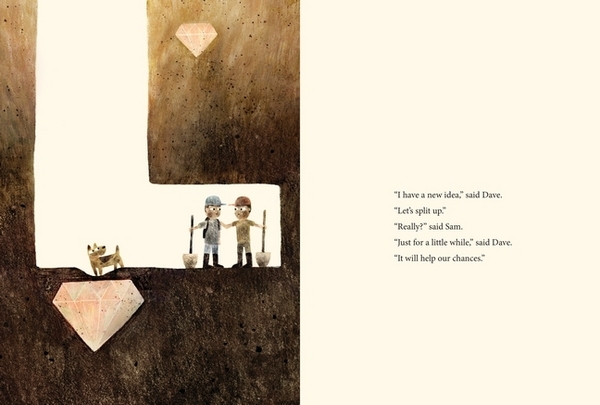 Sam and Dave Dig a Hole is suitable for children aged four years and over – note that it has cemented itself as my number one book for 2014. Find it in all good book shops or online at Book Depository.